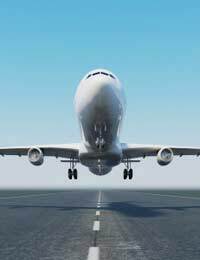 There are many people in the world who suffer from aerophobia – the fear of flying. This condition is seen by many to be irrational and totally unjustified but to those who suffer from it the fear is a very real one which can make them anxious, stressed and in serious cases hyperventilate and become paralysed with fear. But there is another aspect to aerophobia that is not often touched upon and that is the fear of taking off and landing. Why am I Afraid of Take-Off and Landing? There are two aspects to aerophobia; one is the fear of flying itself when you are up in the air and the other is the fear of crashing. Both are genuine fears and the emotions they emit are very real to them and all around them. However for some the fear is not being up in the air it is the getting there and the coming back down again. This has to do with the movement of the stomach and the popping of ears as the plane ascends into the air. It also has to do with the feeling albeit temporarily of losing touch with the ground. Again both fears are irrational to many but very real and very frightening to those who suffer them. What Can I Do to Overcome This Fear? There are self help classes you can attend that will help you control your breathing and your anxiousness and try to alleviate your fears. These are referred to as Cognitive Behavioural Therapy classes and one of their main aims is to openly discuss your fear of flying and help you overcome it by facing it. Obviously it is not possible to simulate the taking off and landing in an airplane on the ground for the general public but these groups can use methods similar to hypnosis which bring about a feeling of calm when the discussion of flying and in particular ascent and descent arises. For many aerophobes the main crux of their fear of flying is that they do not fully understand how an airplane manages to get into the air and stays there for the duration of its journey. Self help groups and psychologists discuss with the sufferer just how an aircraft lifts off and stays airborne and this often goes some way to helping them with their fear. It would be foolhardy to say that overcoming aerophobia is something that happens quickly it does not. However with the right help and support the problem can be managed and can leave the sufferer feeling at least able to cope with their fear should they need to board an airplane. One of the most important aspects of dealing with a phobia is discussing it and if you are the partner or family member of the sufferer, listening to them. Laughing at them or making fun of their phobia only seeks to instill the fear in them further as their frustration at not being able to deal with the problem intensifies it. For further information on how to deal with the problem of aerophobia you should speak to your doctor who may be able to put you in touch with a qualified psychologist. Alternatively contact one of the larger airlines who will be able to give you contact details for registered practitioners who specialise in this particular phobia. I had a girlfriend who was terrified of flying, especially the take off and landing. We did have to fly somewhere and she faced her fear. At takeoff I talked to her very gently, and she grabbed my hand tight. She kept her eyes closed, which helped a little, and once the aircraft had levelled out she was much better. We did the same thing on landing, which was probably more stressful, but did the same things. She's flown several more times since, and it's still not easy, but she knows she can conquer it.